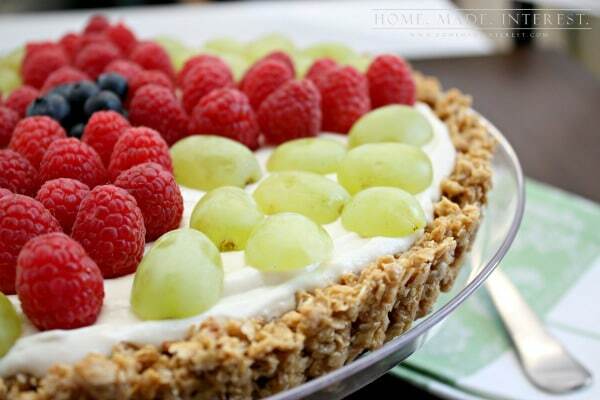 Granola Fruit Tart - Home. Made. Interest. 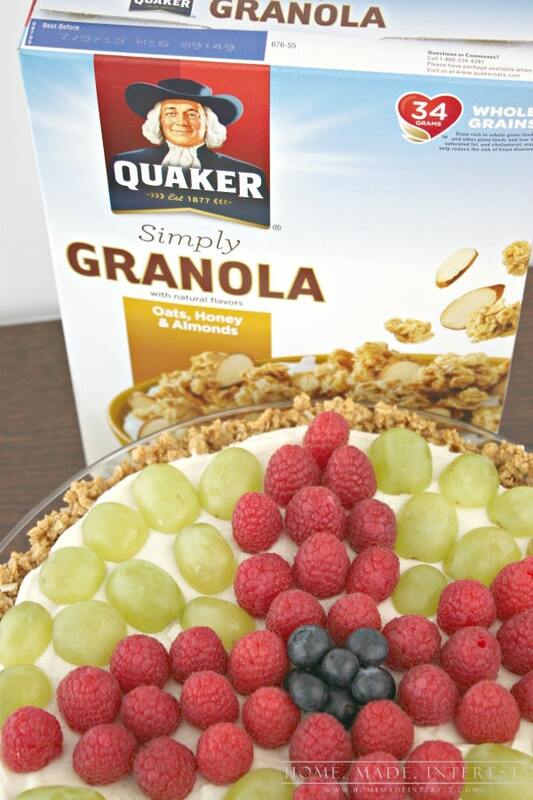 Our Granola Fruit Tart can be a dessert, snack or even a breakfast alternative. It is crunchy, not-too-sweet treat, made with granola, greek yogurt, honey and fresh fruit. It’s that time of year when everyone tries to forget about the ridiculous amount of cookies they consumed the month before (they were delicious!) and start with a clean slate in the new year. I don’t know about you but I like to keep my goals realistic, I’m not going to stop baking. I’m not going to give up sweets completely. I will however, try to bake recipes that are a better-for-you alternative to my usual desserts AND still taste great, so the kids and I won’t even miss all of those chocolate chip cookies. Getting back into the routine of eating oatmeal in the morning has always one of the first things I do to get back on track in the new year. Now Quaker® makes all of these great products like Quaker® Real Medleys® , Quaker® Oatmeal Squares, Quaker® Life, and Quaker® Simply Granola so it’s a part of the kids’ snack and breakfast routines too. My first recipe for the new year uses Quaker® Simply Granola Oats, Honey, and Almonds. 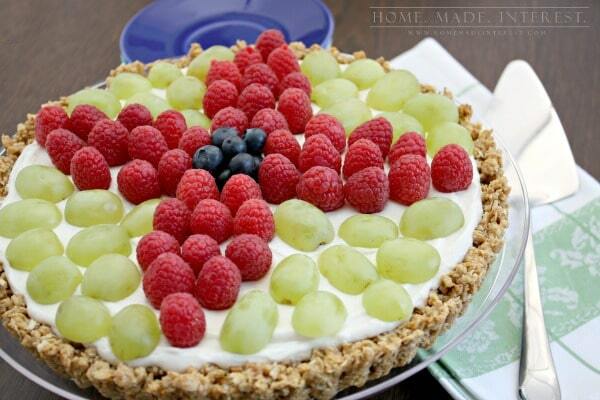 I combined it with honey to form a tart crust and filled it with a greek yogurt filling and fresh fruit. 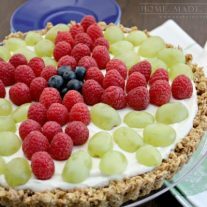 The granola a great better-for-you alternative to graham cracker or pastry crusts and the greek yogurt goes great with the fresh fruit topping. To make the tart crust all I had to do was crush up the simply granola and combine it with softened butter and honey. Then I pressed the mixture into a tart pan and baked it in a 350°F oven for 10 minutes. When it was done I pulled it out of the oven and let it cool completely. While it was baking and cooling I whipped together the yogurt, cream cheese, sugar, vanilla extract and gelatin in a mixer. When the crust was cool I poured the mixture into it and put it in the fridge to set. After an hour I pulled it out and layered it with fresh fruit. I used blueberries, grapes and raspberries but you can use any fruit you like. Didn’t it turn out beautiful? I love the crunch of the granola paired with the creamy not-to-sweet filling and the tart raspberries. This recipe is definitely a keeper. I made it for dessert but it became an after school snack for a couple of days after and the kids loved it. I also think it would make an awesome addition to a breakfast or brunch menu. 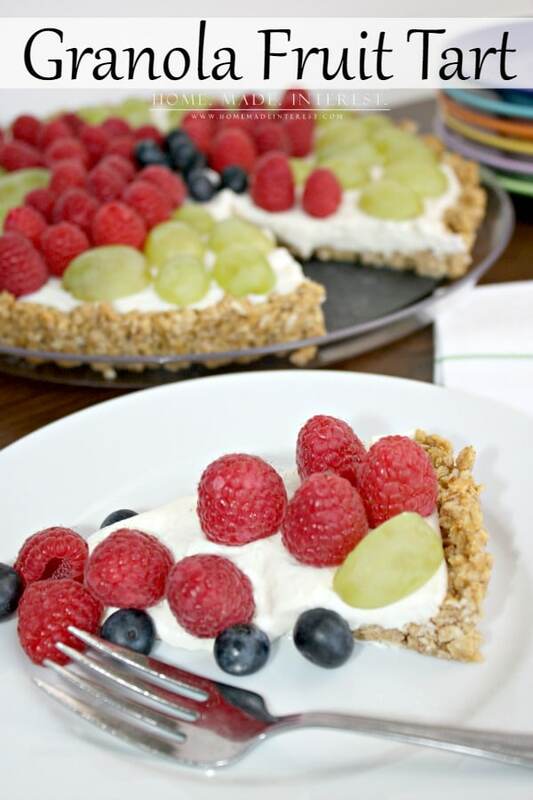 This easy granola fruit tart is a delicious breakfast recipe that is perfect for brunch! Put Quaker® Simply Granola in a freezer bag and hit it with a mallet or rolling pin to crush it. Combine crushed Quaker® Simply Granola, softened butter and honey in a bowl. Mix yogurt, softened cream cheese, sugar, vanilla extract and gelatin in a mixer until whipped completely. 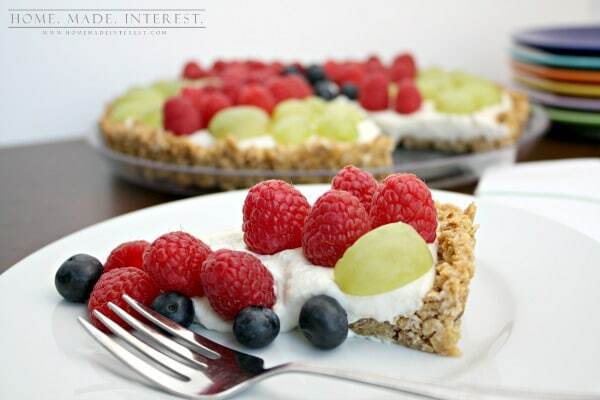 Place tart in refrigerator for least an hour before serving. Top with desired fruit and serve. What foods do you try to get back into your routine after the holidays are over? Let us know in the comments! Great recipe! I’m glad I found you in Inspire Me Monday! Have a wonderful holiday! That crust looks absolutely delish….no wait…the entire tart looks absolutely delish. A healthier edge and still super yummy. It has to be a winner. This looks so yummy. Hurray for pie for breakfast! This sounds soo good! And much healthier than the fruit pizza that I love. It’s the same concept, but with sugar cookie crust and cream cheese filling! This is going on my list of desserts to try! 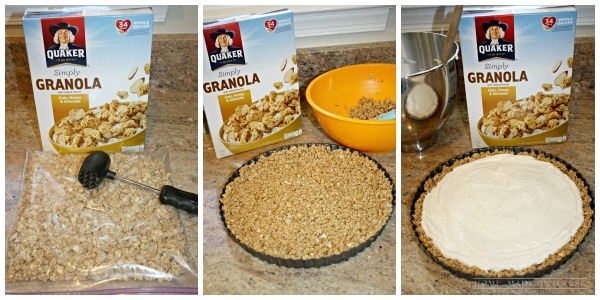 What a great idea to use granola for the crust! I make my own granola and would like to try it with that. We love fruit and this sounds like a good healthy dessert. What a wonderful idea! It looks so delicious but also so healthy at the same time!